There were so many screeners sent to me this week, a week in which I happened to be laid up (along with my son) with the H1N1 virus (we're fine now, thanks), that this will probably be the first of several posts coming your way this weekend in an effort to clear the decks before the start of the De Palma Blog-A-Thon on Monday. Political incorrectness abounds, but it is plain to see that none of it was mean-spirited as much as it was an expression of a more naive era. 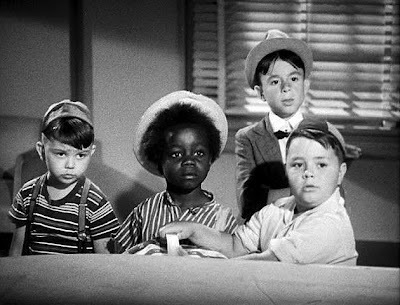 While less spontaneous than the more improvisational early shorts produced by Hal Roach, these feature the best known players, Spanky (George McFarland), Alfalfa (Carl Switzer), Buckwheat(Billie Thomas), Porky (Eugene Lee), and Darla (Darla Hood). Some trivia: Porky would later be replaced by young Mickey Gubitosi, aka Robert Blake (Lost Highway), who you can also see in this collection. For those whose tastes run a little deeper, I strongly recommend Take Out (2004), directed by Sean Baker (Greg the Bunny) and Shih-Ching Tsou. It is an impressive documentary-like look at a day in the life of a Chinese immigrant, Ming Ding (Charles Jang), who works delivering food for a Chinese restaurant in Manhattan. Never preachy, the film is content with presenting its subject's grim prospects by simply placing you there along with him every step of the way. The repetitive nature of his delivery job, the monotony and claustrophobia of working in the kitchen, the constant danger of his deliveries into questionable neighborhoods, are all brought to life by the film. 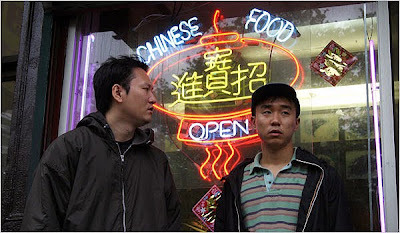 Baker and Tsou illustrate the loneliness desperation that Chinese immigrants face not only in getting to America (his family pools together their money to get him here so he can get paid better wages to send back to China), but surviving in it (he repays his family debt by borrowing from a loan shark who charges 30% interest, and he's fallen behind on his repayment plan). And the film manages to be suspenseful, too. This movie is well worth your time to watch. Still seeking a distributor is Jeffrey Goodman's The Last Lullaby (2008), a small town noir based on the Max Allan Collins novel The Last Quarry. 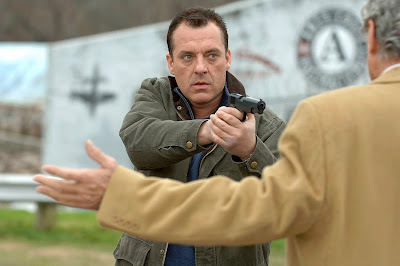 In the film, a hit man named Price (Tom Sizemore) comes out of retirement for one last kill. When the target turns out to be a meek librarian (Sasha Alexander) his curiosity leads him to get a little too close and fall for his prey. The film's cinematography limits it somewhat, never advancing past Movie-of-the-Week territory. But even though the film's plot borders on cliche, Goodman brings some freshness to it, through the unusual decision to have much of the story play out in broad daylight. A uniformly talented cast that includes such character actors as Sprague Grayden (24), Bill Smitrovich (Seven Pounds), and Jerry Hardin (The X-Files) support two strong central performances by the leads. Sizemore's unusual vulnerability in this role makes you long for the day when he can put his personal troubles behind him and start working his way back to mainstream success. A limited edition DVD is forthcoming, more information here. My boys have seen a few Our Gang shorts. Have been looking for a good, definitive collection to share with them. Do you recommend this one? "The Our Gang Collection Is Intended for the Adult Collector and Is Not Suitable for Children"
That's what the back of the box says. But truthfully I've seen them with my own three-year-old, and it hasn't been too much of a stretch explaining some of the more politically incorrect stuff. You just have to be aware that some of the shorts are race/gender insensitive. Another thing to be aware of is that these are not available just anywhere. The Warner Archive Collection, which I have spoken of here before, are Manufactured on Demand because they tend to be titles that are less in demand than most mainstream DVDs. They are DVD-Rs which means they may not play back in DVD Recorders or PC Drives. But they will play in regular DVD players. At $34.95, this 5 disc set is $15.00 off right now. You can order it here.